Its not often that Wellington City Council allows a bach (crib to you southerners) to be built at Frank Kitts Park on Wellington’s waterfront. However, before Waterfront Watch get too alarmed, this construction was the live demonstration / test of the First Light house, developed and built by Victoria University School of Architecture students. This is their entry to compete in the U.S. Department of Energy Solar Decathlon 2011 — the only entry, ever, from the southern hemisphere. 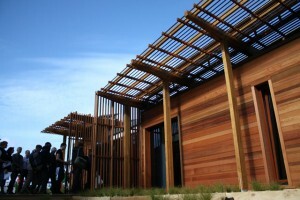 The Solar Decathlon is run every two years, held in the National Mall of Washington DC, and involves 20 university teams competing over 10 criteria to demonstrate they have created the best clean-energy dwellings, by building solar-powered houses that feature cost-effective, energy-efficient construction, that incorporates energy-saving appliances and renewable energy systems. This is a highly prestigious event to be invited to, let alone to hopefully win. It is a challenging exercise that not only provides hands-on training, it also inspires innovation and research, and provides a practical demonstration of the many benefits of renewable energy and energy efficiency. A group from our office visited the display a few weeks ago and we were genuinely impressed at the level of detail the students have gone to, and at some of the innovative thinking behind it all. The contest is not to create a small windowless box, but inspiring architecture. This is expressed by the decathlon categories, which cover architecture, market appeal, engineering, communications, affordability, comfort zone, hot water, appliances, home entertainment, and energy balance. In this respect the kiwi team have created a modern interpretation of the iconic bach, complete with living, dining and sleeping spaces, home entertainment system, full kitchen, shower and laundry. The bach features R6 insulation in the walls, as opposed to the more usual R2.6 installed in most new houses in NZ. Triple glazing in timber frames, for thermal bridging reasons. Reverse cycle heat pump that is ducted into rooms, solar hot water heating, and an array of photovoltaic panels to provide power. The bach will be connected to the grid, but it will have a two way meter, with the idea being to have either zero or negative power usage during the competition. Even with a mighty big skylight in the centre and big folding doors for that lovely indoor/outdoor flow we all hold dear, the inside temperature only lost 1.5 degrees during one particularly frosty night, without any heat input. Apart from having all of the energy efficient features, the bach also needs to be demountable so that it can be transported half way round the world, and back again. That even means thinking about the timber cladding, where Canadian Cedar was used to avoid it deforming due to the different humidity in the northern hemisphere, and hidden fixings used (from behind the boards) not only so demountable panels could be made, but also to stop a thermal bridge at each nail or screw point. To show that the buildings are functional, the team must host two dinner parties and a movie night during the competition, including all of the cooking and washing up. Plus they must wash and dry a load of clothes in less than 3 hours. In conjunction with Leap Ltd they have developed a hot water drying cupboard that works by using heated water pumped through a heat exchanger to heat the air inside the cupboard. Combined with hot water filled rails, the system dries the clothes quickly while a fan extracts humid air from the cupboard. The dryer uses only a small amount of energy to power the fan and the remainder is powered by solar hot water. While the team have not announced how much this bach has cost to build (and they certainly have a deservedly large corporate backing to make it happen), all of the technology, control systems, and building systems are commercially available in NZ. However I suspect that the capital cost of the technology would not be palatable to most people looking to build a home at the moment, especially when it is scaled up to suit an average size house. That is not to say that this will be the case in the future, and hopefully the near future. I think we all look forward to the time when these systems and technologies are run of the mill, and comparatively affordable.